They say the most successful entrepreneurs are the ones who solve problems that they themselves face. When Tutuwa Ahwoi left her native Ghana to study in Paris, she started suffering from serious skin issues. The climate was new to her body and the products she had access to were not natural. “My skin was just like, No!”, Ahwoi remembers. She missed her local skin products. Pure shea butter and black soap, staples across West Africa, were near impossible to find in Western Europe. It was in Paris that Ahwoi met Thato Tau of Botswana. She was also having skin trouble, but being from Southern Africa, she had never heard of black soap and had never used shea. They started sharing products and when they returned back home after school, Tau kept asking Ahwoi to send her products to Botswana. At first, this side hustle was just to help out a friend (and her friends! ), but before she knew it, Ahwoi was working full time on Nokware, a natural skincare line. In the crowded personal care space, Nokware stands out because of a strong environmental and social mission. This mission was not a conscious choice at first. “It’s not like we sat down and decided to not use plastic. We were just like, ‘Why import plastic from China just to have it end up in a gutter in Africa? Why take it out of its original packaging?’”, recalls Ahwoi. Nokware sells its products in containers made of calabash (dried gourds) and bamboo, just like it’s always been stored in Ghana. Ahwoi will be the first to admit that they are not all the way to their goal of ‘zero plastic’. Their bamboo packaging has a thin layer of plastic coating on the inside to protect the product, but their team is constantly working to eliminate it. The honesty and transparency are refreshing in a world of brands built on a highly curated image of perfection. Nokware employs 7 people, all women. This was not a conscious choice either, but Ahwoi and Tau have embraced it. “The patriarchy here runs very deep”, said Ahwoi. She loves that they are creating jobs for women typically left behind. Their first employee could neither read nor write. By helping women earn an income, they are giving them a voice and power in their homes and communities. Women, who are often responsible for taking care of children, husbands, and a small garden, don’t think of work as a 9-to-5 endeavor. Ahwoi shared, “If there is work to do on a Saturday, they work!”. Even as a successful and educated woman, Ahwoi cannot always escape society’s tiring expectations. When she drives a pick-up to do deliveries, men often shout at her to return her car to her boyfriend. She’s not discouraged. She believes that if you change only a few minds, that new mindset can spread virally. 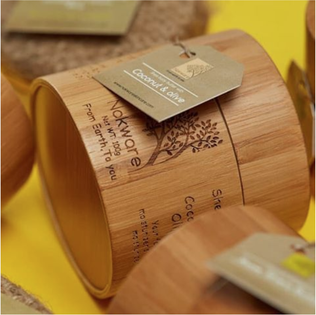 While Nokware’s commitments to creating opportunities for women and to using “zero waste” packaging are admirable, it is their promotion of inclusive beauty that really brought the company into the spotlight. Growing up in Ghana, Ahwoi always heard, “Light skin is the right skin.” She wanted to use Nokware to counter this hurtful bias. The company posted a picture on Instagram, with 9 beautiful women of different tones, shapes, and hair types with the caption, “Loving your own skin is so important! There’s absolutely no need to feel the need to change the shade you are. There’s different shades of beautiful, yes, including yours!” Internet trolls immediately tried to take over the campaign, giving each girl a number and commenting on which women were prettier. They made their bias for light-skinned women clear. Ahwoi admitted, “At first I got very angry and had to stop myself from fighting on the internet, but for every 1 negative comment, there were 10 positive ones. The community used the positives to drown out the negatives.” It helped that most of the negative comments were coming from men who are outside of their target market. You can buy Nokware’s all-natural skincare products from their website, http://bit.ly/2TaXqr2.